The Little Magpie: A day in Gola! Today’s post brings to you three mockingbirds, two outfits and one sassy new shoe collaboration*. That’s right, Gola and Swarovski have paired up to make a collection that’s unexpected but oh so right. I really love Gola as a brand; I love how effortlessly cool their trainers are whilst still being comfortable to wear (case in point; I bought this wee rainbow pair recently and they've been an absolute joy) so I was really excited to see what would come of this collab. There are four styles in total in the collection - which you can check out here - so I chose to style up one white pair and one black pair to keep things even. Each trainer, you'll see, has a sparkly swarovski detail somewhere on them to make them stand out that little bit from your usual trainer. 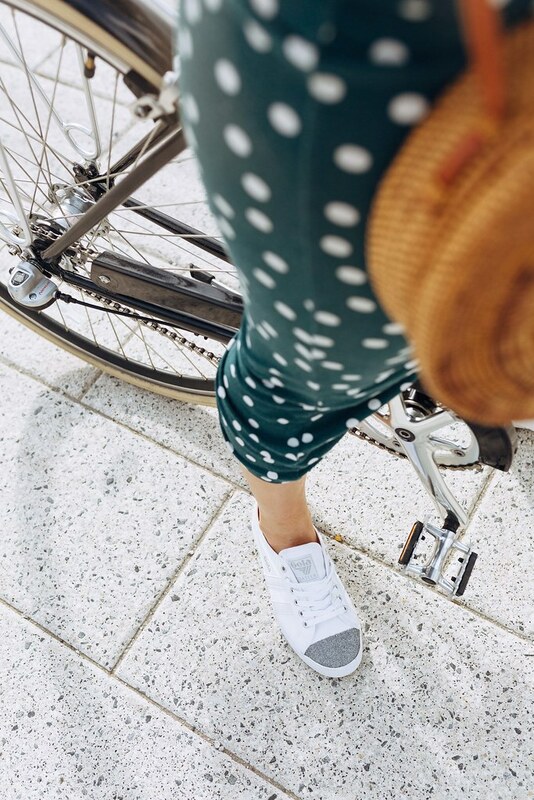 I often get asked what I team the polka dot midi skirts that I wear constantly (almost too often, some would say) with and the answer is either espadrilles or trainers. Because it’s quite a tight, saucy shape it’s nice to balance it out a bit with some casual action on the feet for daytime wear. We’ve been walking so, so much in New York - I know I like to exaggerate but I’m being serious here, I walked ten miles in one day last week. TEN - so the trainers have been a gift from god. Like walking around on two beautiful, sparkly clouds. We decided to go on a wee cycle too (honestly there is no end to the things women can do in bodycon skirts) so I popped on my trainers and off we went to explore Domino Park and the riverfront. It was another sunny day - I promise I'm not trying to rub it in your face, I'm merely documenting it so I can look back when I'm home in Scotland and remember that sun in Autumn actually exists somewhere in the world - so the light kept glinting of the tip of the toe and making them sparkle which was very, very enjoyable. In hindsight, possibly also a little dangerous to have something glinting at you when you're on a bike but helmets were invented so people could wear diamantes on their toes without any risk of danger, right? *Oh no wait sorry, there are no mockingbirds. For the second look I decided to channel my inner Parisian man; striped tees and high waisted trousers... you really can't go wrong. I own a couple of pairs of black trainers now and I love how versatile they can be but, also, how sleek and Sophisticated (with a capital S) they can look depending on how you wear them. For this reason they work really well for a city look; you're wandering around and want to be comfortable whilst still looking like a cool cat? Black trainers. I've since worn them with an all black outfit - Parisian man, cat burglar, my inspiration really is very varied - and they look uh-mazing. Very very chic. I'll leave you to have a little look at the collection here if you so fancy! Absolutely love that green skirt! I love the skirt, it´s gorgeous! Love both outfits! The polka dots skirt is so cute!